That’s a lesson I learned years ago from a theoretical physicist named Richard Feynman. I never met him, but he was one of my teachers as a fellow human being, and that’s one of the lessons that has stuck with me the most since I learned it, so I want to, in turn, share it with you all now. There’s a way of looking at the world with new eyes, as if we know nothing about the way we do things here on this planet. One of Feynman’s examples was sleep. Imagine you’re a Martian and you arrive here on Earth for the first time, and you notice that for some reason, humans need to kind of shut down for around eight hours every rotation of the planet. Why? What’s it like? How do humans experience daily unconsciousness? Does it hurt? Do our thoughts just suddenly stop? Or do we kind of just slow down and drift away? It’s interesting isn’t it to think of things we take for granted as part of our normal daily experience? With that said, let’s talk about something else humans do, and have done for a very long time. Imagine you’re a Martian and you notice that humans give pieces of paper to each other, or slide little plastic cards, and in exchange one person gets some form of resources in return, be it biological fuel, or colorful soft outer skins to adorn themselves with, or transport from one place to another in some vehicle. As if that isn’t odd enough, some humans seem to have virtually unlimited pieces of paper, or plastic cards that can get absolutely anything in return, while others have no paper, and no plastic card, and many humans simply refuse to interact with them because of it. Perhaps oddest of all, humans appear to prevent each other from access to Earth itself. Humans are born here, but without those pieces of paper, they seem to not be allowed to live here. Think about that fact for a moment through Martian eyes. Humans are the only species on planet Earth who have to pay to live here. What does that even mean? How did that happen? And what the hell is money? As Alan Watts, another teacher of mine I never met, once taught me, money isn’t real. It’s a tool of measurement like inches. It’s just a construct we use to help distribute access to scarce resources. The stuff money is meant to measure is real, but money itself is not real. To help illustrate this, Watts told a fictional story about all the banks of the world deciding one day to store all of the gold in the world on one island deep underground, so that instead of shipping gold all over the world, they could just move stacks a few feet here and there. This went on successfully for years you see. Everything was much easier. All that was required was some bookkeeping. No more hauling gold all over the world. Then some bankers decided to visit to see the gold only to discover that unbeknownst to everyone, a few years before, there had been a catastrophic subterranean earthquake and all the vaults had been swallowed up and all the gold had disappeared. But so far as the bookkeeping was concerned everything was in perfect order. What this plainly reveals is that money is nothing but bookkeeping. As Watts said, “It’s figures. It’s a way of measuring what we owe the community and what the community owes us.” But it’s also more than that. It’s trust. When we spend money, we get what we want in exchange for it because the person receiving it trusts that they will be able to do the same thing. All of us trust these little pieces of paper, because we have faith in one another to believe in its usefulness. The moment we lose faith in each other to do things for each other because of the paper we hold, money as a tool breaks. We’ve even seen it break before. Back during the Great Depression, if we as Martians looked at humans both prior to and in the middle of the Great Depression, nothing was different. The same number of humans existed. The same amount of resources existed. The same technology existed. As Watts described, it was like showing up one day at a construction site only to be told by the foreman to go ahead and go home, because that day, they were simply all out of inches. All out! No inches today, everyone! So my Martian friends, just how much intelligent life is there here on Earth after all? As of just recently, there are now two human beings currently worth over $100 billion dollars each. It’s hard to comprehend what that means, so let me suggest imagining you are a billionaire and I’m broke. The wealth gap between you and them is $99 billion dollars. The wealth gap between me and you is only $1 billion dollars. So basically, compared to them, as billionaires, you are 99 times more broke than I am, relatively speaking. It’s extremely difficult to comprehend just how much money $100 billion dollars is. Saying the words is just words. Word labels give it the illusion of comprehension, but it’s just that, an illusion. If we were to count to 1,000 right now, at a rate of one every second, it would take 17 minutes. Counting to a million would take 12 days. Counting to 100 billion would take 3,200 years. 3,200 years ago, was 1181 BC, and the Trojan War had just ended. Another way to think of this amount of money is that Jeff Bezos is accumulating money at a rate of about $150,000 per minute, or around $2,500 per second. If he walked by a pile of $25,000, it would literally not be worth his time if it took more than 10 seconds to stuff it all into his pockets. What’s it even mean to say Jeff Bezos is worth $150 billion dollars? Most of that value is in Amazon stock. What’s that mean? Those are special units of measurement that people want because they tend to grow in value over time unlike ordinary units of measurement that tend to decrease in value over time. But what it amounts to is that Jeff Bezos has hundreds of billions of times more access to the collective productive output of the entire human race, than a significant portion of the entire world population combined. I just want us to think for a moment about what that means. Why is it that one human can have virtually unlimited access to the natural and collective resources of the Earth, while billions are actively prevented from any access at all, without exchanging increments of the limited amount of time they have alive, for access to the life-sustaining resources being withheld from them. It’s withheld. That’s one of the most alien things of all. Long long ago, nothing was withheld. Life required work, but it had no price. The Earth was a free-for-all of land, animals, and vegetation. We didn’t even trade with each other. It was mostly a gift economy built on trust where we gave stuff to each other and did stuff for each other, and then felt the social obligation to do the same for others as members of a community. Then one day, some humans drew lines on the ground and shouted “Mine!”, then went about accumulating more and passing it to their kids who passed it onto their kids, and now here we are, where everyone not born into wealth has to sell their lives in order to live what’s left of their lives. This has been going on for so long, that humans have grown used to it as normal. People actually fight now over the right to sell their lives to others in order to live. Those who can’t find a paid occupation are left to potentially starve, and those who don’t wish to starve are willing to work for any pittance in competition for the available jobs. It’s normal that people go without food and shelter. It’s normal that people are constantly worried about losing their jobs. It’s normal that people live stress-filled lives, month to month, never certain if they’ll obtain enough pieces of paper that month to prove their worth as human beings. It’s like the fable about the fox and the grapes, where humanity decided that because it couldn’t reach the grapes, they must be sour anyway. The freedom to live without masters is sour? Once I started seeing things in this way, I couldn’t unsee it. It’s all wrong. It’s immoral. As a Martian, I just won’t stand for it. The productive capacity of the human species is immense. Earth is a spaceship rocketing through the cosmos full of passengers who don’t even know they’re all billionaires. We have the resources, we have the knowledge, we have the people power, we have the technology, to create a world of abundance for everyone. All that’s stopping us really, is a thing we call trust. That’s the one thing we don’t yet have an abundance of, but we can change that. Thinking as a Martian, if humans were to decide to trust everyone a minimum amount, such that no human had no trust, but every human had some trust, and that amount of trust was sufficient for everyone to obtain a minimum amount of access to the resources necessary for life, then everything would change. Yes, our ancestors put locks on everything long ago, but here are the keys. I trust you to unlock your own food, because I know you need it. I trust you to unlock your own housing and your own clothing, because I know you need it. I trust that you want to do useful things that are inherently valuable, for yourself and for your community, not because you’re forced to, but because you want to. That’s the message of Unconditional Basic Income. People tend to get caught up in the amount of money, but UBI goes deeper than money. Money, and the amount of money, is the least important aspect of UBI. It’s just the vehicle for what’s being expressed, which is trust. I trust you this much unconditionally. I will continue trusting you at least this much every month for the rest of your life. I don’t own this planet, or the long history of human accomplishment. It’s not mine to withhold from you. Here. I trust you will put it to your own best use, in ways I never would have considered, because I’m not you. Here. You don’t need to do something for me first. That’s not how trust is built. Trust is given. And if you want more access to resources than this, you can choose to find voluntary paid employment, or you can employ yourself, or you can refuse employment and refuse to attach a price tag to what you choose to do instead. You are just as valuable to me and the rest of our community as a volunteer, and as someone who cares for others. I trust that the life you will pursue with your basic needs unconditionally secured will be one of meaningful purpose because all of us want that. I trust we are alike in that way, that we both seek to be part of something bigger than ourselves, and that the best work is done not because you have no choice, but because it is your choice. I trust you to explore the outer limits of human knowledge, to learn, because learning is one of life’s lifelong pleasures. I trust you to form meaningful relationships with those around you, as part of communities large and small, because social bonds are important to us. I trust you to engage in the practice of self-government, to be informed and to help inform others, and even to run for office for the privilege of being my own representative in government. I trust you as a human being, to live your life on your own terms, not mine. 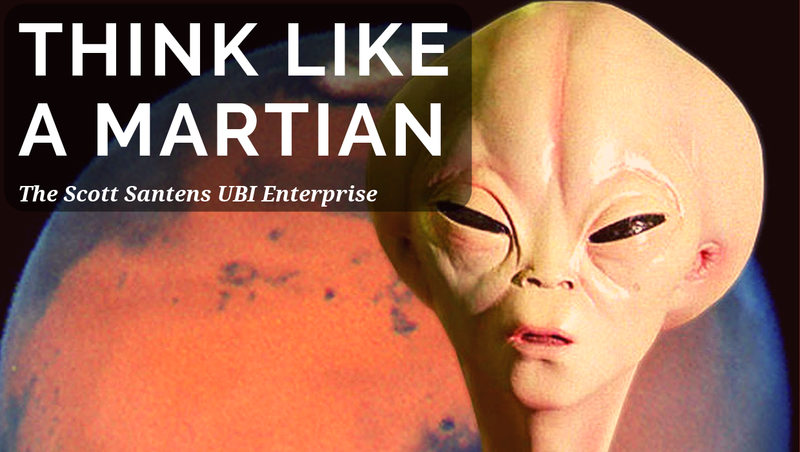 This is how a Martian sees UBI. The question then becomes how do we get from here to there? How do we start trusting each other? This is where pilots and legislation come in. We already know that poverty hurts all of us. We already know that highly unequal societies, and societies full of chronic instability and stress is actively harmful. We don’t need more data to learn that people need food to eat and roofs to sleep under, and that when provided money, they buy those things, because they need them. We don’t need more evidence that when the shackles are removed from people’s necks and the whips are taken away from their backs, that people choose to keep working. We have piles of evidence that a world without UBI is hugely expensive in so many ways. Not only does it lead to worse health and more crime, but it leads to lower productivity thanks to rampant lack of engagement in all the work we aren’t truly choosing. It leads to reduced entrepreneurship, less innovation, and more self-medication of human misery. It leads to less education, learning, and knowledge, as people seek out money instead of self-improvement. We already have the evidence. What we lack is will. So as we go forward designing new experiments to gather new data, let’s see them as what they are. They are human trust experiments, to test over and over again, if we should treat each other as human beings deserve to be treated. Each new pilot is important, not so much for the data, but because it’s doing on a small scale something that needs to be done everywhere and as often and for as long as it can be done — treating people with goddamn human dignity. It’s hard for us to take big steps forward, and so lots of little steps can eventually accomplish that big step. Pilots are those little steps. But I’d rather see little UBIs. If we’re going to dip our toes in the water, instead of treating thousands of people with thousands of dollars worth of human dignity, let’s try also to just start treating millions of people with hundreds of dollars worth of human dignity. As Ontario most recently has made tragically clear, pilots end. Actual policies however, especially when fully universal, are far more permanent. I think we need to be more open to actual policy steps, however small in amounts. Yes, let’s eliminate personal tax allowances and other tax subsidies and instead provide those tax expenditures universally as a small UBI. Yes, let’s create wealth funds like in Alaska and distribute small dividends universally. Yes, let’s look at what we’re already doing, and just cut the strings. I think the biggest steps we can take in a world where distrust is the default setting of societies everywhere, is to create policies of universal trust. Where universal trust is not yet politically possible, trust experiments can move us forward, but let us always remember that all of this is about our civilization learning to trust. 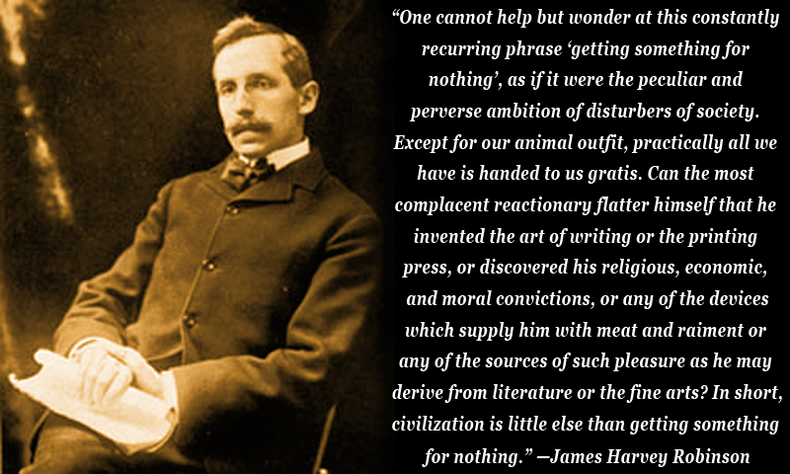 Keep in mind that word too — civilization. Unconditional Basic Income is not just a big idea. It’s a civilizing idea. It’s evolutionary, not revolutionary. Without UBI, humanity cannot yet call itself civilized or even all that evolved, really. And here’s the thing too about civilization: It’s the ultimate example of something for nothing. I’ve shared what I’ve learned from Richard Feynman and Alan Watts because they’re both no longer alive. There’s nothing I did or could have done to deserve their teachings. I never knew them. They never knew me. The wisdom they shared with me was a gift. All of civilization is a gift from the past. Every single one of us alive today inherited this world from those who walked on it before us. Do any of the children born tomorrow deserve that they are being born into a world with cheap solar power, self-driving cars, AI-powered robotics, running water, sewage treatment facilities, every book ever written, calculus, and even the language I’m using right now to frame and communicate my thoughts? Did the children born centuries ago deserve to be born into a world plagued with smallpox, people owning other people as property, and the burning of women who dared to be born left-handed? No. When and where we are born is not deserved. It’s not earned. It’s given to us by those who themselves received the gift of civilization, built upon it, and passed on new knowledge that wouldn’t have ever been achieved if every generation was always starting over from scratch. We don’t deserve our smartphones just because we paid for them. We have the privilege to be walking around with a small supercomputer in our pockets, and all we can ever do to come even close to deserving it, is to use them and the rest of technology to build higher the sum total of human knowledge and achievement, to then pass on to those after us who we will never meet. As the saying goes, society grows great when the old plant trees whose shade they know they will never sit in. UBI is an inheritance being withheld by those who believe the shade is only for them. Civilization is about paying it forward. It’s about working to create a world that’s even better than this one, where even more people have the opportunity to live lives of even greater flourishing, meaning, and discovery. In Star Trek, another dead teacher of mine, Gene Roddenberry depicted the future as it could be. I want us to reach that future, and I think we can through UBI, but there’s something else I want us to consider about the Star Trek universe he created. It’s widely known to fans, but as the story goes, humanity was discovered by our fellow neighbors in the galaxy, not by Martians, but by Vulcans upon our technological achievement of warp drive, and thus the ability to travel faster than light. Our crowning achievement was a technological one. But what if it’s not really about technology? What if humanity’s crowning achievement is not technological but sociological? What if the test of what counts as an advanced civilization is not the tools we create, but how we treat each other? Think about it. As a Martian, as a Vulcan, as anyone not from this world, are you ever going to trust a species that has never learned to trust itself? I think that’s a test we have yet to pass. Like my writing? Please subscribe, share widely, and consider making a monthly pledge of at least $1 or a one-time donation via PayPal or cryptocurrency in support of my work in advocacy of unconditional basic income. Special thanks to: Haroon Mokhtarzada, Steven Grimm, Floyd Marinescu, Roy Bahat, Andrew Stern, Aaron T Schultz, Larry Cohen, Ace Bailey, Albert Wenger, Daragh Ward, Gisele Huff, Joanna Zarach, Justin Walsh, Robert Collins, Stephane Boisvert, Victor Lau, Peter T Knight, Arjun Carl Watts, Carrie McLachlan, Che Wagner, Chris Rauchle, Daniel Brockman, Danielle and Michael Texeira, David Ihnen, George Scialabba, Gerald Huff, Gray Scott, Jack Canty, Jan Smole, Jess Allen, Joe Ballou, Matt DeKok, Max Henrion, Michael Honey, Michael Hrenka, Myi Baril, Natalie Foster, Paul Godsmark, Rachel Perkins, Reid Rusonik, Vladimir Baranov, Will Ware, Alvin Miranda, Bryan Herdliska, Casey L Young, Chris Boraski, Chris Smothers, Dylan Taylor, E. Davies, Elizabeth Balcar, Elizabeth Corker, Georg Baumann, Janos Abel, Jill Weiss, Kai Wong, Kev Roberts, Kirk Israel, Lee Mark, MARK4UBI, Meshack Vee, Oliver Bestwalter, Thomas Welsh, Tim Timothy, P O’Connor, Valentina Petricciuolo, Villi Haukka, Walter Schaerer, all my other funders for their support, and my amazing partner, Katie Smith. 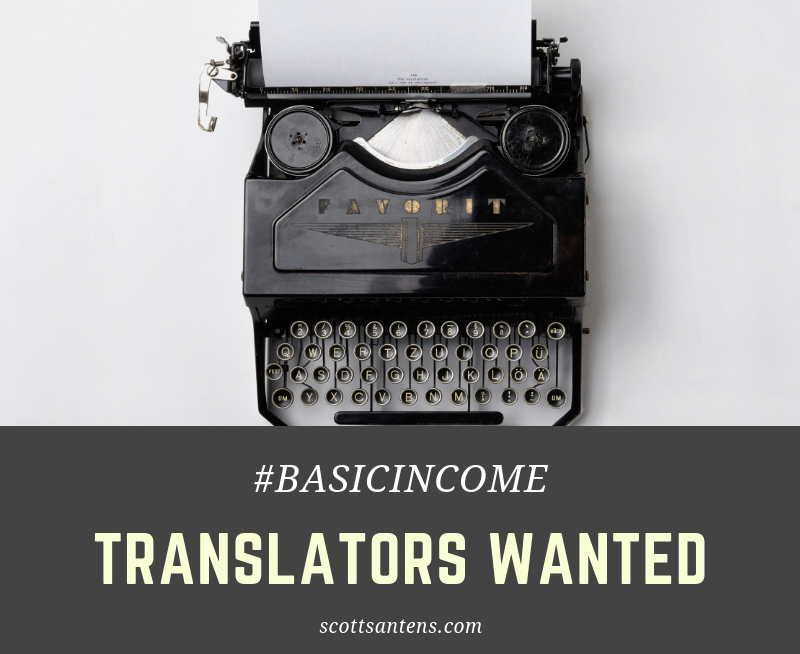 Scott Santens writes and speaks about the idea of unconditional basic income. You can follow him on Medium, Twitter, Facebook, TechCrunch, Futurism, Steemit, Twitch, Anchor, or Reddit where he is a moderator for the /r/BasicIncome community of over 60,000 subscribers. Anyone is welcome to translate and post this article anywhere in other languages, and I will share a link to your translation here: Italian, Spanish. Think others should read this post? Please click/hold the applaud button.